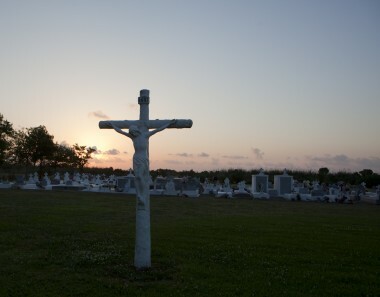 As rising seawater inexorably rearranges the geography of coastal wetlands in the Mississippi Delta, cemeteries that serve as final resting places for untold numbers of American war veterans are being swallowed by the advancing Gulf of Mexico. 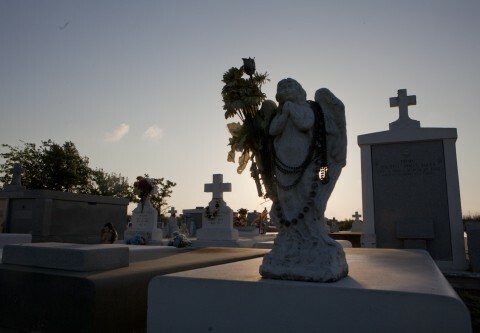 Battling the inevitable disappearance of these coastal graveyards and family burial plots, two Louisiana State University researchers are engaged in the daunting task of marking the graves, as it were, in a detailed databank. Along the Louisiana coast — a once-critical military vantage point battled over by the French, British, Spanish and Americans — are more than 500 cemeteries, many containing the graves of service members from wars recent and long past, starting with the War of 1812. Scientists say that over the last century, waters have claimed over 1,900 square miles of Louisiana’s coastal wetlands — more than a third of the state’s coastal plain. The situation worsened in 2005, when Hurricane Katrina caused the submerging of 215 square miles of marshes and barrier islands. Older and more historic gravesites tend to be near the coast. Hurricane storm surges exacerbate coastal erosion by weakening natural defenses against rising water, according to the Union of Concerned Scientists, an independent group that studies the effects of climate change on the environment. Ms. Schexnayder and her research partner, Mary Manhein, a Louisiana State University forensic anthropologist who helped recover the remains of the Columbia space shuttle, are recording information on the coastal cemeteries before it is too late. They have compiled data for 93 cemeteries since 2011, with their priority being those closest to the water. They use advanced GPS technology to make perimeter maps of each cemetery. They then match the information with historical records to identify who, exactly, is buried in each plot so that a record will exist after it is submerged. Not the least of these is Chalmette National Cemetery in Chalmette, La. Nearly two centuries ago, Gen. Andrew Jackson and his outnumbered troops faced off against British invaders there in what would turn out to be the last battle in the War of 1812. President Abraham Lincoln later designated a roughly 17-acre space adjacent to that battle site as a burial ground for those lost in the Civil War. The cemetery, 150 years old this year, originally contained 132 Confederate prisoners of war; they were reinterred at Cypress Grove Cemetery in New Orleans in 1868. Years later, more graves were dug to bury soldiers who served in the two world wars, Korea and Vietnam. Unlike the French- Spanish tradition of elaborate above-ground crypts for which New Orleans is known, the cemeteries under threat from rising waters most often contain common men who went off to war and were brought home and buried — some immediately, some decades later. One such endangered place is Holy Family Cemetery, which lies about 70 miles south of New Orleans near the tiny bayou town of Dulac. No more than 20 yards of cow pasture separate the tiny square of land, which includes some two dozen plots, from the bayou waters. Among those interred there are a handful of veterans from World War II and Vietnam, as their headstones indicate. In 2008, during Hurricane Ike, the usually tranquil waters of Bayou Dulac ripped caskets from their cement slabs. The caskets bobbed in the waters like massive cement corks, recalled Alan Gibson, a local commercial shrimper and farmer, who braved the weather and tied coffins to telephone poles, fence posts and anything else to secure them. There are no trees left. “This was solid oaks and cypress, and now there’s not a standing tree,” Mr. Gibson said on a recent morning, pointing to a flooded area that now threatens both his pasture and the adjacent cemetery. It is where his family used to hunt deer before the land washed away. 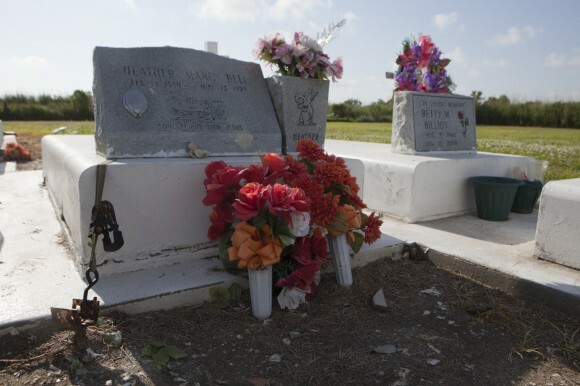 When the water began to recede after Hurricane Ike, he lugged caskets back to their plots. The cemetery had flooded at high tide, forcing Mr. Gibson to build his own small levee and connect it to a drainage system he uses to protect his pastures. The tidal flooding problems he encounters, near Holy Family, occur throughout the speckling of bays along Louisiana’s coast. Beginning about 150 years ago, residents built levees to control flooding that is natural to such a vast delta. As a result, Delta marshes once fed by the Mississippi River dried up, leaving the coast more exposed to rough Gulf waters. In recent decades, rising water caused by climate change made further claims on the land. One cemetery in Leeville, La., is on the cusp of washing away. In fact, it is only accessible by boat. In such areas, the family graves were abandoned when residents left coastal towns for higher ground, said Michael Pasquier, a professor at Louisiana State University who studies the cultural impact of coastal erosion. Headstones and caskets are not readily transportable, of course, and some have been abandoned for more than a century. One of the most imperiled burial grounds is Cannon Cemetery in southeast Louisiana, which was heavily damaged by Hurricane Katrina. Nine years later, blue tarps from the Federal Emergency Management Agency still cover some of the graves, Ms. Schexnayder said. A sign at the entrance to the cemetery asks visitors whether they know the identity of bodies in some of the crypts that inevitably will be covered by the sea.